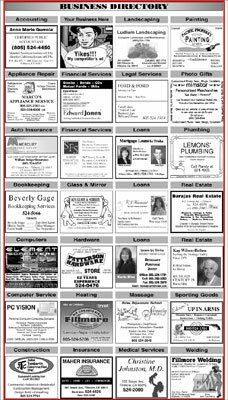 To place a Print Display Ad, click here. To place an Online Display Ad, click here. To publish any Legal Notice (Fictitious Business Name Statements), click here. To get listed in the Printed Newspaper's Business Directory, click here. 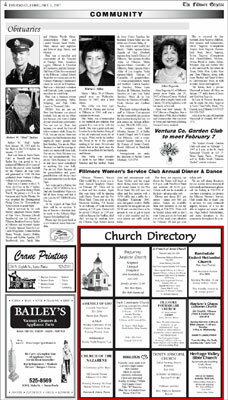 To get listed in the Printed Newspaper's Church Directory, click here. 1x4=4 column inches = $24/wk. 2x2=4 column inches = $24/wk. 2x3=6 column inches = $36/wk. 2x5=10 column inches = $60/wk. 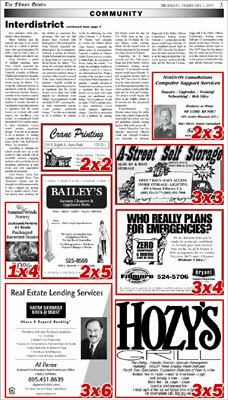 3x3=9 column inches = $54/wk. 3x4=12 column inches = $72/wk. 3x5=15 column inches = $90/wk. 3x6=18 column inches = $108/wk. 6x21= 126 column inches = $756/wk. Full Color on any advertisement add $275/wk. FULL PAGE = 11-1/2 inches wide by 21 inches tall. Please call for more details. (805) 524-2481. Size: 1.75 inches wide by 2.5 inches high. Requirements: 3 month minimum run. Only minor (address and phone number) changes allowed. Size: 3.75 inches wide by 2 inches high. 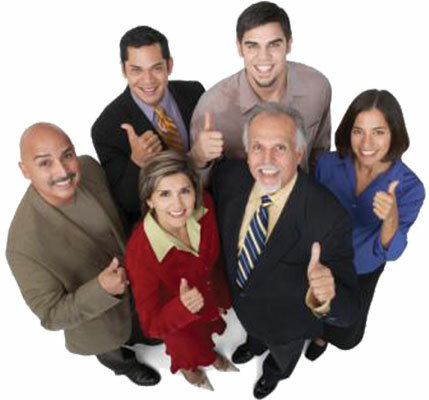 Real Estate & Help Wanted Ads: $20 per 30 words, per week. All Other Ads: $10 per 30 words, per week. 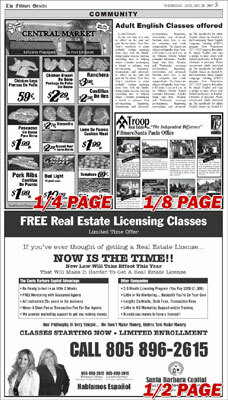 "Found" Classified Ads are always printed free of charge. Classified Deadline is Tuesday at 3:00 p.m.
Email your Classified Ad to us, then call us with your credit card information. We accept Visa, MasterCard and American Express. $20 Dollar minimum required on all credit card payments. Simply mail us your Classified Ad and payment by check or money order. Make checks out to The Fillmore Gazette. Stop by our office anytime during business hours. You may bring your Classified Ad in with you or fill out a Classified Ad Form when you arrive. Payment is accepted by check, money order or cash. Question: If I go over 30 words, will I be charged per word? Answer: No. Every 30 words counts as one Classified Ad. You will be billed for two (2) Classified Ads placements if you go over 30 words. Lowest Price In The County for Fictitious Business Name Statements! Only $50 Dollars! For ONLY $50 dollars we will publish your Fictitious Business Name Statement (FBN) four (4) consecutive weeks, AS REQUIRED BY LAW. If you are filing more than ONE (1) NAME, please add $5 dollars for each additional name beyond 1. Legal Notice Deadline is Tuesday at 2:00 p.m.
For all other types of legal notices, please see the price list below. #1) By Telephone: Simply call (805) 524-2481 and we will take your credit card information over the phone (we accept Visa, MasterCard, and American Express). You can then either FAX or MAIL your FBN to us. #2) By Mail: Simply enclose the cover page of your FBN Statement (the one with the bar code) and a check or money order and mail to The Fillmore Gazette, P.O. Box 865, Fillmore, CA 93016. Please write your phone number on your FBN or on your check just in case we need to contact you. 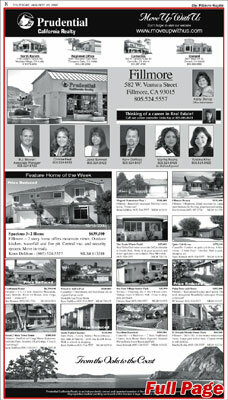 #3) In Person: Simply stop by our office located at 408 Orchard Street, Fillmore, CA. 93015 during business hours with your FBN Statement and pay by Check, Money Order, Cash or Credit Card. Proof of Publication: After the 4th week of publication we will forward a PROOF OF PUBLICATION to the Ventura County Clerk's office ONLY. WE DO NOT SEND ANYTHING TO YOU! You may check the accuracy of your legal notice by scrolling further down on this webpage approximately 10 days after beginning publication, or use the website's search function to locate your legal notice. Adjudication: The Fillmore Gazette is fully Adjudicated for the County of Ventura and the Ventura County Judicial District.